We have a great new fun thing going on each week in the Polka Doodle Dandies facebook group - you have the chance each week to win a prize by voting on your favourite make from the Design team! We thought that as we judge you guys each week it would be fun to let YOU judge us! You can take part just by joining the group and adding your vote - we'll choose a random winner every week to win a free digi prize so well worth having a go! too which you can find HERE!! More chances of fab prizes! Firstly - we have a great SPECIAL CODE for you this week, specially for our lovely Bloggers! Use code W9PDB15 at the checkout and you will receive 15% discount to the Digiworld Store until this Sunday! Whoop Whoop!! Great deal and opportunity to grab something lovely!! Anjie - My make started out life as a plain MDF tag that I got at a craft show last year. To start with I painted over it all with white gesso to give it a base. I then covered it in paper from the Dollie Daydream Goes East Collection. I then added some faux stitching around the edges and then painted over it with Iridescent Paste to give it some shimmer. I then coloured an image from the Candy Doodles Collectors Edition CD using my Graph'It Markers. I added a flower from the Dollie Goes East CD and some lace and ribbon from my stash. 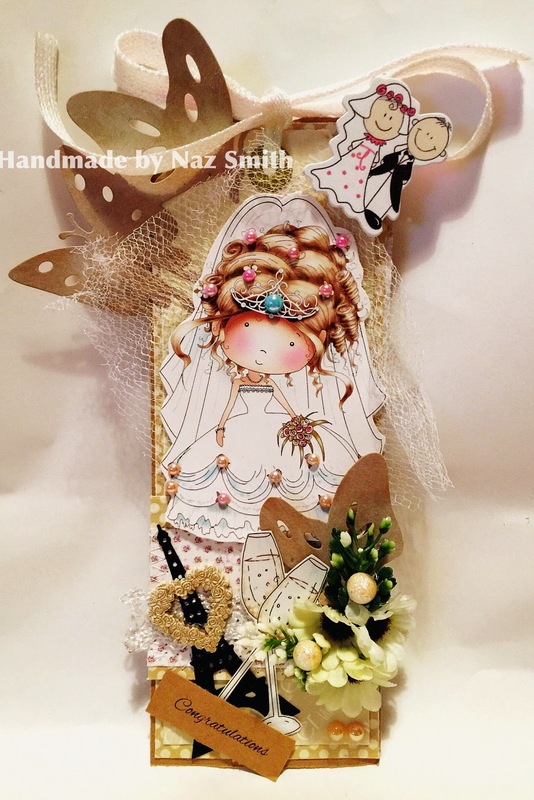 Naz - I used Work & Play Collection 9 - Love and Kisses for my creation. The papers I have used are also from the same collection. I cut the papers and used Tim Holtz Distress Ink called Frayed burlap on the edge of them. The image I have used is from the same collection called Over the Threshold Couple and coloured it with my watercolour pencils, I also added some glitter using a glitter pen to the girl's hair. I used some ribbon lace on both sides of the card and added a bow and some flowers to embellish the card. 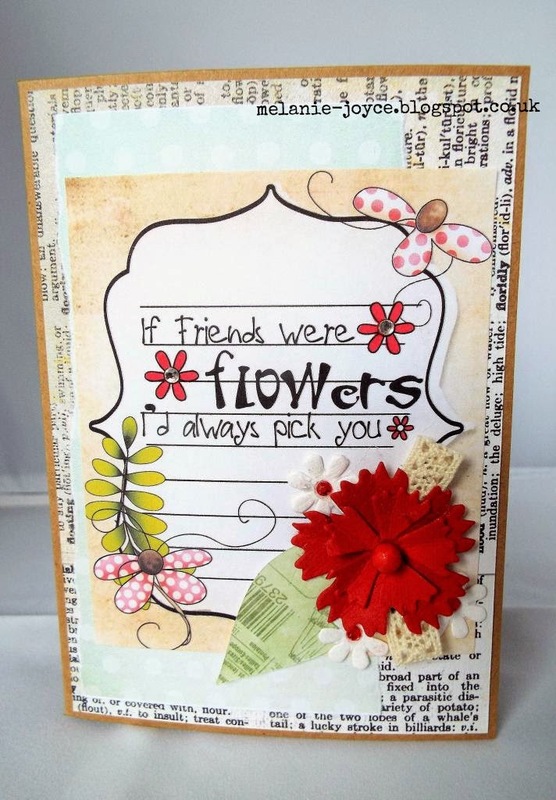 The sentiments I have used on my card are also from the same collection. Yvonne - Hello there! Well I LOVE ribbon and I LOVE lace so I LOVED this challenge! 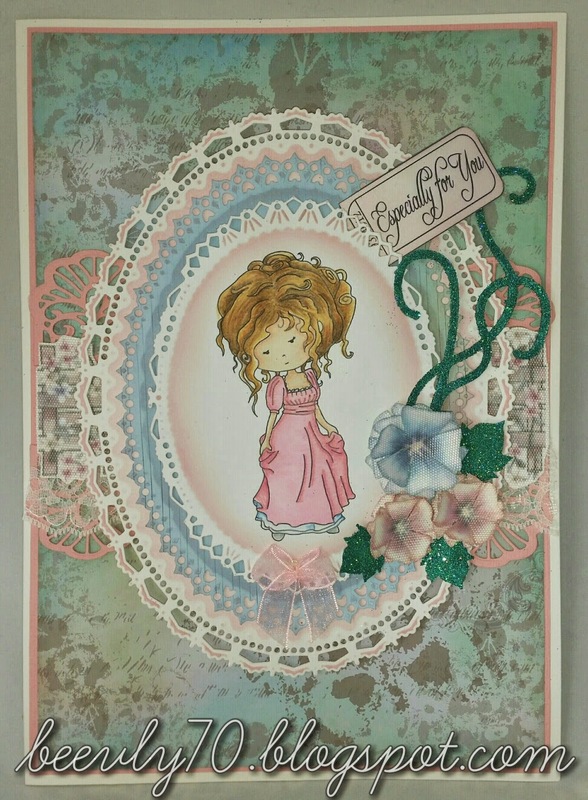 I opted for the beautful Fredericka Debutante image off of the Fredericka Mini Collection or you can get the digi image here. The papers I used are from the Rose Budd Collection, which you can get as a digi download or as a CD-Rom. I embossed the backing paper and edged with Distress Ink. I coloured Fredericka with my Graph'It Markers, a range of which you can find here. The ribbon flower and lace are from my stash. 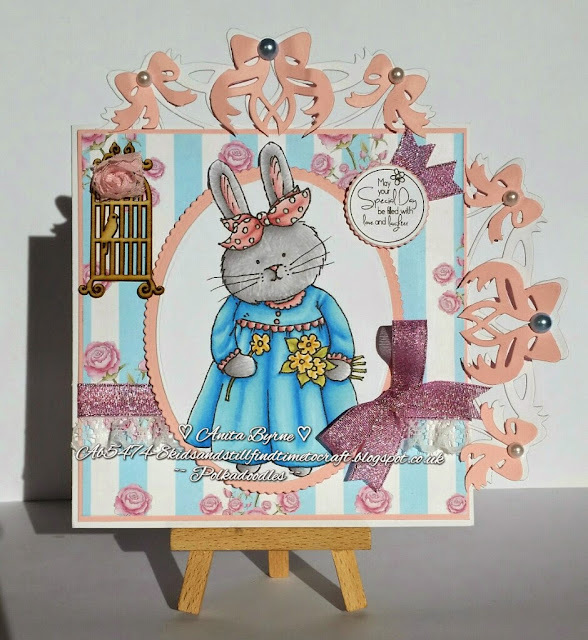 Anita - hi there today I had fun with this challenge ribbon and lace I chose to use the cherryblossom lane collection I have to say I was so in love them all such cute images with stunning backing papers to match, I coloured this sweet little bunny with alcohol markers and had loads of fun on the folds. 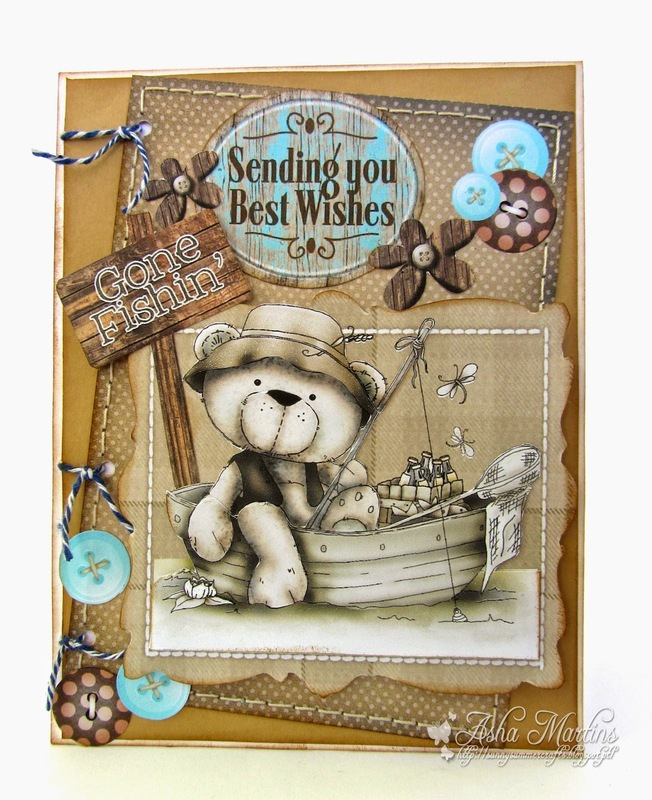 Jenny -Here we go with another fun challenge and I've used a couple of collections to make this card. For the papers I've used W&P9 and for the huge 70 I've used Winston, hope you can join us and pop over to my blog and see how I did it. Wendy - Yay, lace & ribbon, my favourite embellies! I've used the pre-coloured Princess Bride from the Work & Play 9 'Love & Kisses' Collection, you can also get her as a Digi on her own here. The flowery backing paper is also from this collection. Bev. 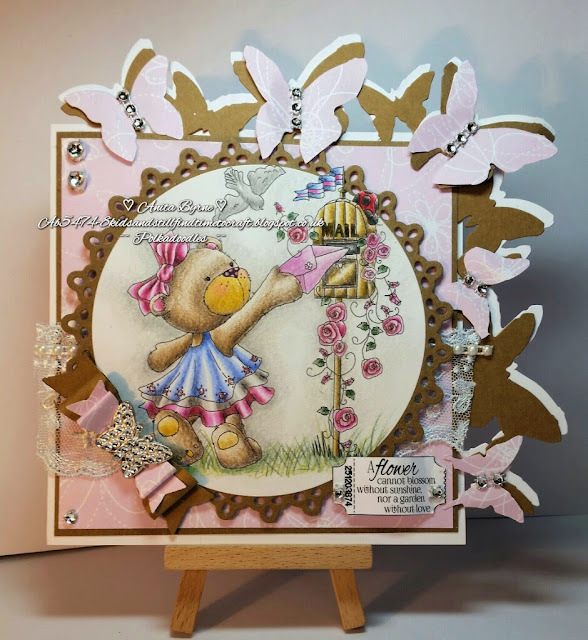 The minute I saw the title for this weeks challenge I knew exactly what collection I would be using, Rose Budd all the papers, sentiment and flowers are in the collection, for me it just oozes romance and that era is all about lace & ribbon. I coloured the digi with my Graph'it Markers. The flowers are printed onto canvas paper and layered up & I used the lush ivy cutting file and glittered it up to add that bit of sparkle! Love and Kisses also available as download .If you pop over to my blog you will see the inside of my card as it unfolds. Ria - Ribbons and Lace are my favourite embellishments so that means PARTY on my card with Party Emily she is coloured with alcohol markers and enhanced with pencils. The papers are from the gorgeouss Work and play 9 collection. And the beautifull flourish is cut with my Silhouette Cameo and this is the Flourish 2 cuttingfile from Polkadoodles. my creation has been coloured with Copics my favourite choice of Medium..
What gorgeous makes this week - so much variety from everyone and some really fun ideas!! Our All things Kraft challenge winners will be announced next Friday - we look forward to seeing your lovely entries for this challenge! See you next week! 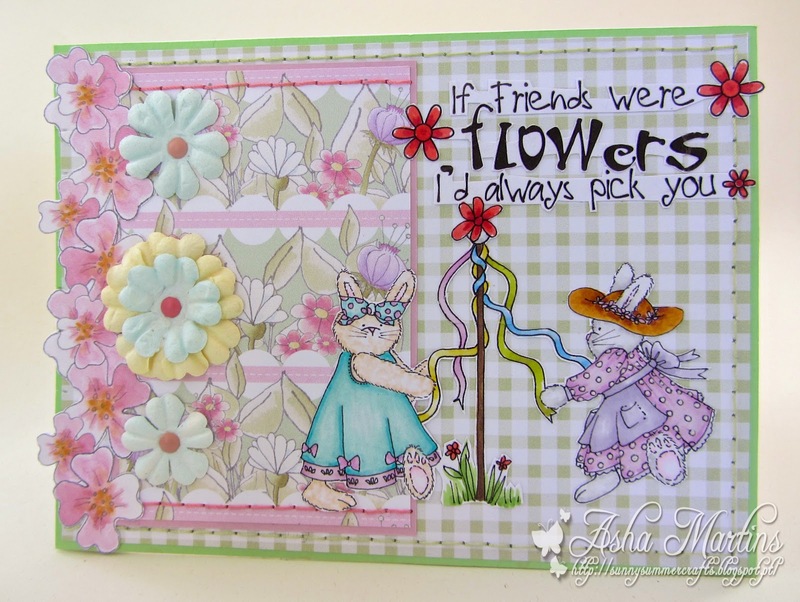 The winners of our Flower Power Challenge will be announced at the end of this post. You need to make something which includes either some kraft-style cardboard or chipboard, a tag, string, twine, kraft paper/card, brown wrapping paper - anything that gives a kraft look, it can be a little brown button, a little bit of string on a parcel - anything that gives your make a krafty embellishment somewhere, it's up to you! It's a great way to bring in some recycling along the way with old cereal box cardboard etc! awesome creations to share with you. You have until Noon GMT, Friday 27th February to enter. Digi Download store to spend on whatever you like- What an amazing Prize! Naz - I made a tag using the bride digistamp as well as few papers of Polkadoodle's collection Work & Play 9 - Love & Kisses to give my tag more texture and layers. Also added the wine glasses as I thought it was perfect for the theme, I added some flowers, ribbons, lace and diecuts from Kraft paper and to finish it off I added this sentiment from the collection that I printed on a Kraft paper. Anjie - The image is a pre-coloured one which we tend to forget are on the CD's these days. The blue hearts I have cut out from the backing paper which was left over after making the card. I used the Tim Holtz Vintage Photo distress ink around the edges of everything and then added faux stitching with the Graph'It Shake white marker pen. More details can be found on my blog by clicking on my name at the right. 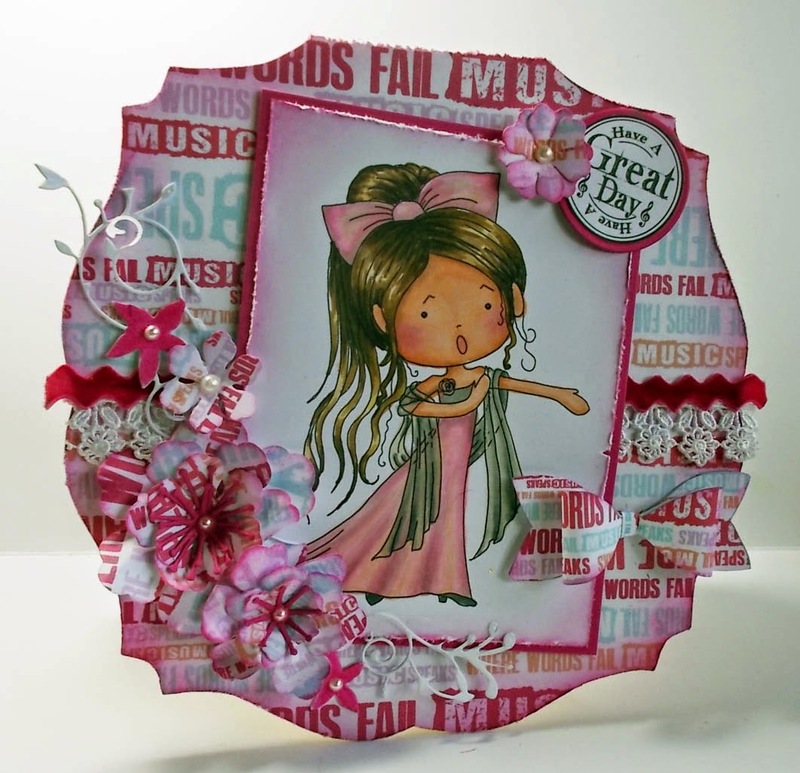 Jenny - Had another play with the new Work and Play 9 collection, but the the papers are from Dollie Daydream Girl Talk. Lots more details on my blog. Yvonne - Hi there everyone - well I decided to make a wee wall hanging. I opted to use one of the new Octavia images, 'Dragonfly Ride' and I went with the precoloured image. You can get the fab CD-Rom here and see the whole digi download options here. I used my Cameo for the wall hanging template and then everything else is from the Collection, bar the clouds and the ribbon. Anita - Hi there today I had a play with etty mailbox from the Winston bear collection CD-Rom I coloured her using pencils. 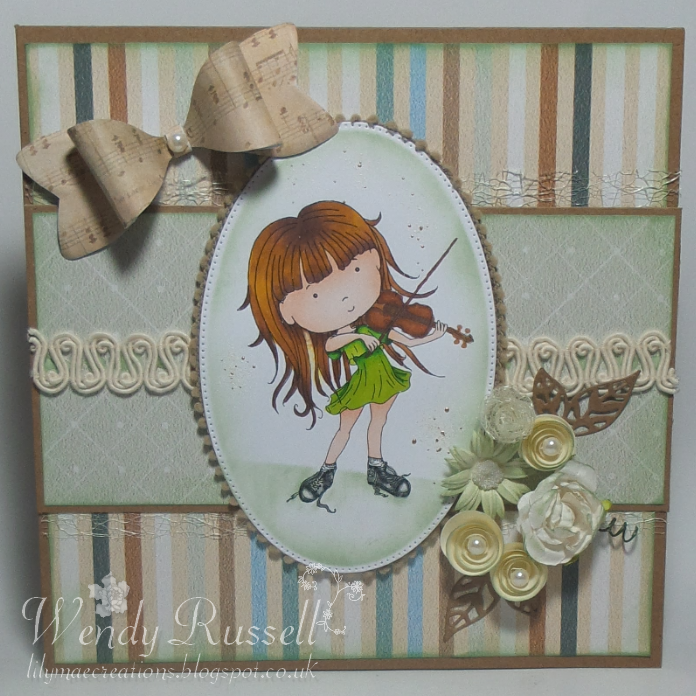 Wendy - For my contribution this week I've used the Violin Girl from Work & Play 8 and I've coloured her with Graph'its, she's also available on her own as a digi. I've used a bit of artistic licene with my chioce of papers, which is from the same collection. Although they are not strictly Kraft, I felt the muted colours and the texture gave that impression. 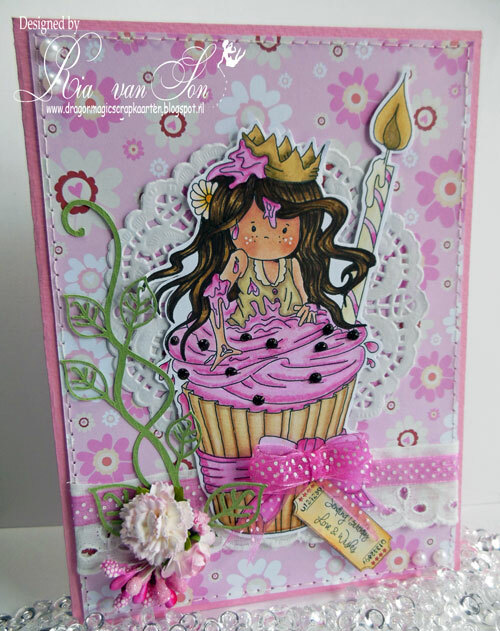 Ria for my card I used the Work and Play 9 collection Love & Kisses... I coloured up Wedding Night with Watercolouring pencils and added white dots with a Molotow marker. Most of the cuttingfiles are from the Love & Kisses Collection except the flowers as they are from the cuttingfile Flowers 1. all cut with my Silhouette Cameo. Bev here with my inspiration post. When someone says 'Kraft card' to me its the perfect excuse to get out the Winston CD Rom. I had great fun colouring him up with my Graph'its. I can't wait to see what you guys come up with! Susan What a fabulous Challenge ! 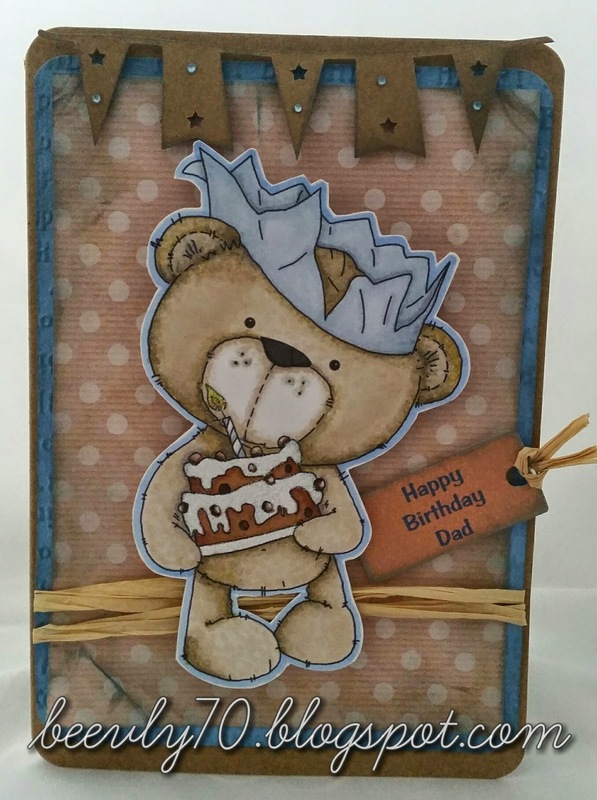 So here we go...The Papers are from the Winston Collection and the Images are from Work & Play 7 .I have used everything digi this week even the image, so no colouring.....hows that for a quick card! Claire C I adore kraft so I had a blast making this centre step card using lots of elements from the fabulous Work and Play 8 Bonus Edition Collection. I just added some die cuts, ribbon and a button from my stash to all the gorgeous embellies. The focal image is decoupage from the cd too!! Well done and congratulations to everyone. Don't forget to take you blinkies from the side bar too. We are very excited to announce that we are looking for some additional talented crafters to join our Digital Design Team so if you would love to be involved with the team please read our criteria below and contact us! We are looking for more than one person and we specifically need people from around the globe who can colour using alcohol markers, pencils or distress inks (any brand) and people with a variety of skills. 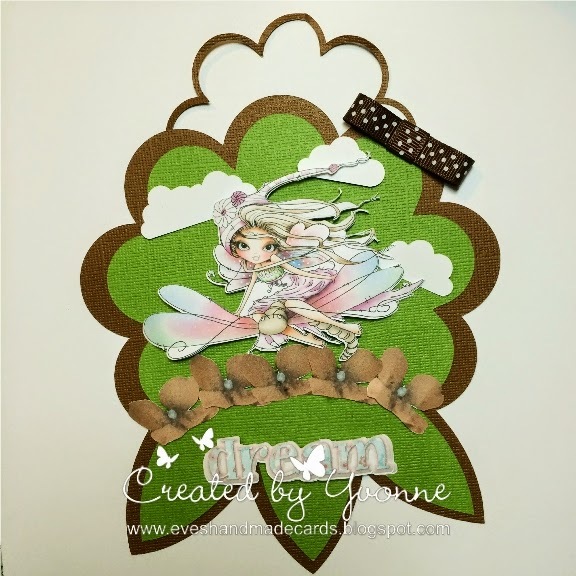 You MUST be willing to use digital products and love crafting with characters whilst also be able to showcase other styles of cards and projects too. This is a new team and members will be expected to take part in all our Facebook activity, including a weekly challenge, regular Facebook events and a busy posting schedule. At Polkadoodles we are first and foremost a business and our promotions support that, so we require more input than a 'hobby-type' blog where you would have sponsors that change from week to week - being on our team means you are valued and will be expected to work hard during your time with us, but you can also obtain great exposure for your creativity and we have opportunities for other things along the way too including the possibility of becoming a sample maker and having your work shown here on our UK TV Craft Channel. You will need to use downloadable digi stamps and printables including our awesome backing papers and embellishments (we also have cutting files if you use them). We are always on the lookout for exceptional creative talent that can help us make our products look great and help to promote the Polkadoodles brand. 1. You must be able to commit long term to a very busy team - many people underestimate how important this is, we're not interested in people who flit from team to team to gain new stash or having no staying power, we commit to you and so we need that commitment back. You will be given a 2 month term initially with a review to joining us permanently after this period. We need you to make a minimum of one project every week during your time on the team. You will also be expected to: actively promote our brand on Facebook in our Facebook groups/Twitter/ Instagram/ Pinterest and your own blog if you have one. Being active on Social media is a pre-requisite to being on our team (you don't have to do ALL of these). You will be expected to leave comments using our rota system for people who enter our challenges and to vote weekly through a rota. If you are a great colourist you may not need to make an actual card project if we think your colouring is suitable to promote in the way we need. 4. Skill level - you need to be of a suitable skill level and be capable of good composition in your projects. Projects need to be finished to a good standard. 5. Photos - you MUST be able to take good photos of your work. Your photos represent our products and they need to be a good standard to showcase them properly. We can help with this if needed. It's hard to say what we're looking for in terms of the style we're looking for, but we need a high standard of work - you need to be able to create a project from scratch and to be able to think outside the page now and then - we need versatility from our team. So, it doesn't matter if you like fussy or clean and simple, it's about the overall composition and skill level you can present. We sell SVG cutting files and digital papers and kits, so you must also be prepared to used your printer! If you don't like printing your own papers then please don't apply as this will be required (our papers are not expensive to print because of the way we design).You will be generously rewarded with products to use during your time on the team in return for your hard work and commitment - the more work you do for us the more you will be rewarded. All entries will be replied to. Hello out there! Wow - what a week this has been. we have a few new teamies to introduce! They have fabulous inspiration for you and wonderful blogs. Click on their name and go take a peek! Catch Nikky on Create and Craft this Friday 13th February, 8am!! Your chance to check out the fabulous new releases. o include Kraft somewhere in your creation. You have until Noon GMT, Friday 27th February to enter. Digi Download store to spend on whatever you like!! Whoop Whoop! And our Top 3 favourites will all win a £2 voucher to spend on digis in the store too - even better! Now let's hand it over to the Design Team to show you their inspiration for you this week. Scatty Jan - E is for Etty and I just adore her - She is part of the Winston collection and also available as a download. I have used one of the pre-coloured images but Etty is also available as a digi, how cute is she. The E box is made using paper from the Kraft paper section on the CD , and all the embellies, flowers etc that I have used can be found in the collection. 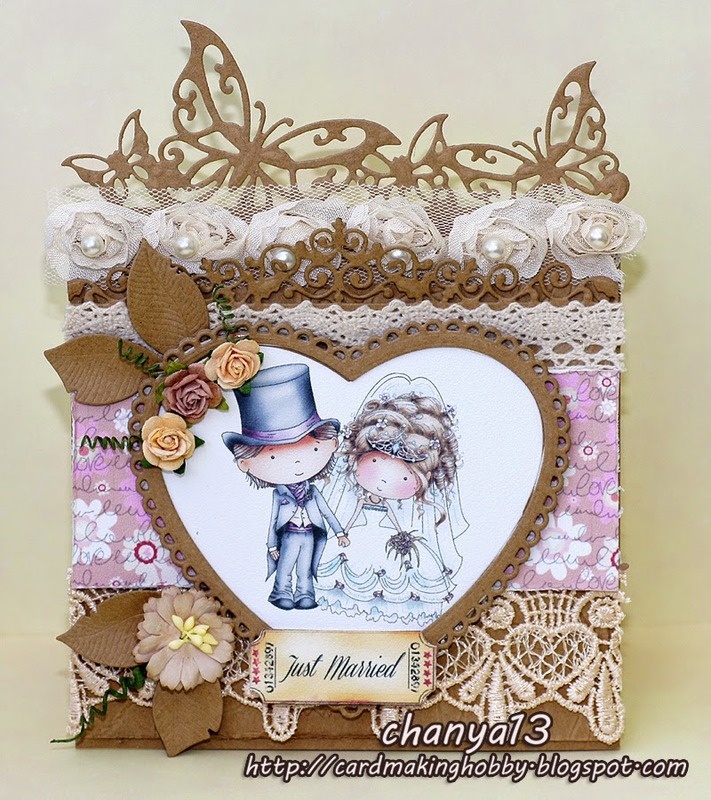 Agnieszka - for my Kraft card I have used the lovely Work & Play 9 Love & Kisses - Full Download Bundle. I have used one of the pre-coloured images, it is also available as a digi Bride & Groom. 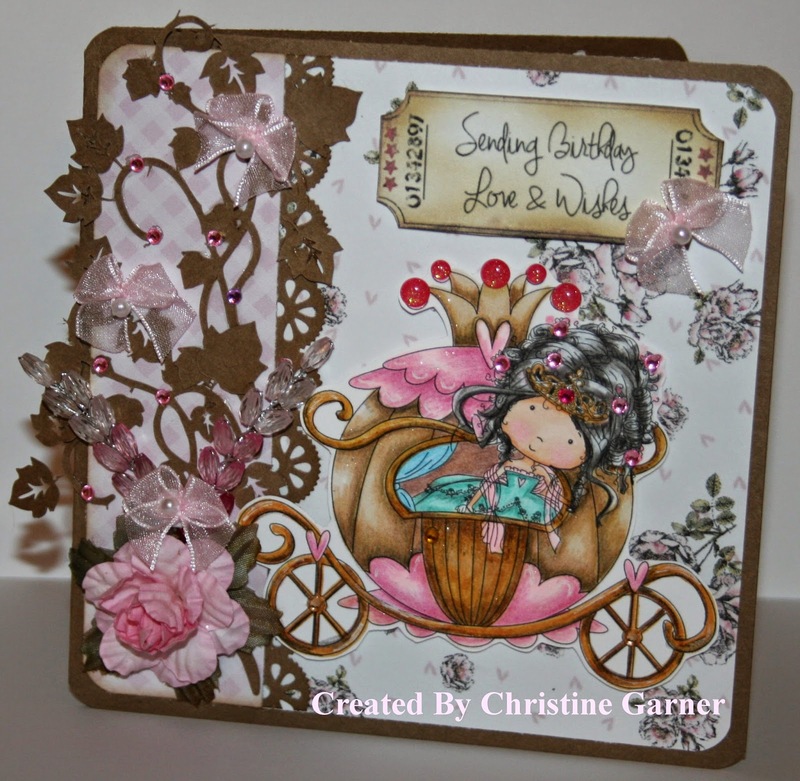 I also added pink flowery paper and sentiments "Just Married". Dawn - For my All Things Kraft I have used various elements from the Work & Play 9 CD Love & Kisses. 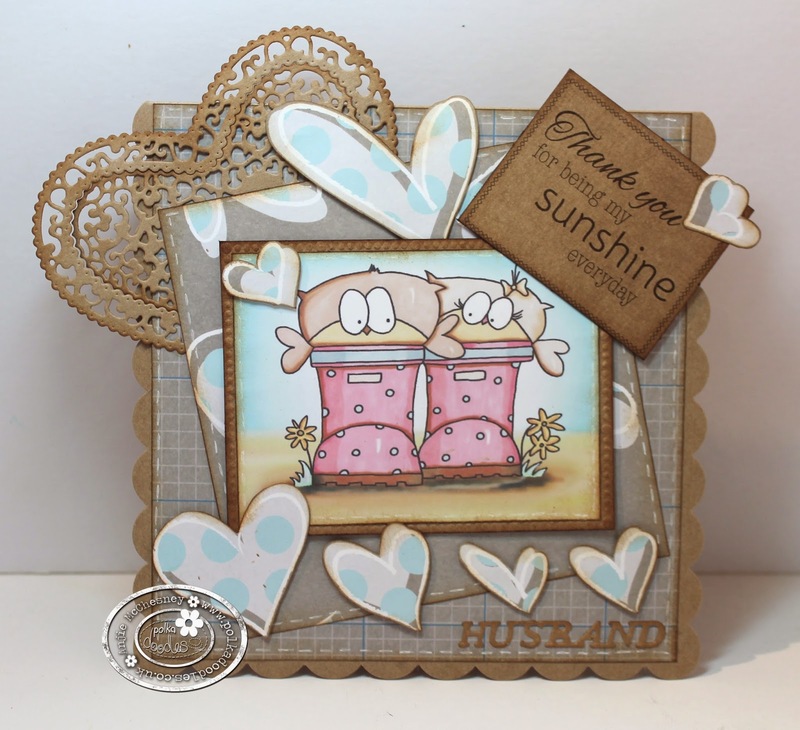 I chose to use one of the templates included in the CD & cut out by hand the stepper card, I then covered it with papers, and coloured an image with Prisma pencils onto Kraft card. The word bliss was made by printing out the scrabble letters, again onto Kraft card. All of these are found on the CD. I added a Magnolia flower flourish die & Christmas lace die & all ribbon, flowers & dew drops are from stash. Asha - I'll be honest, this week's challenge crept up on me. If it's not a challenge, it's somebody's birthday. A card is never at hand when I need it. Not anymore. Enter - DESIGN SHEET. 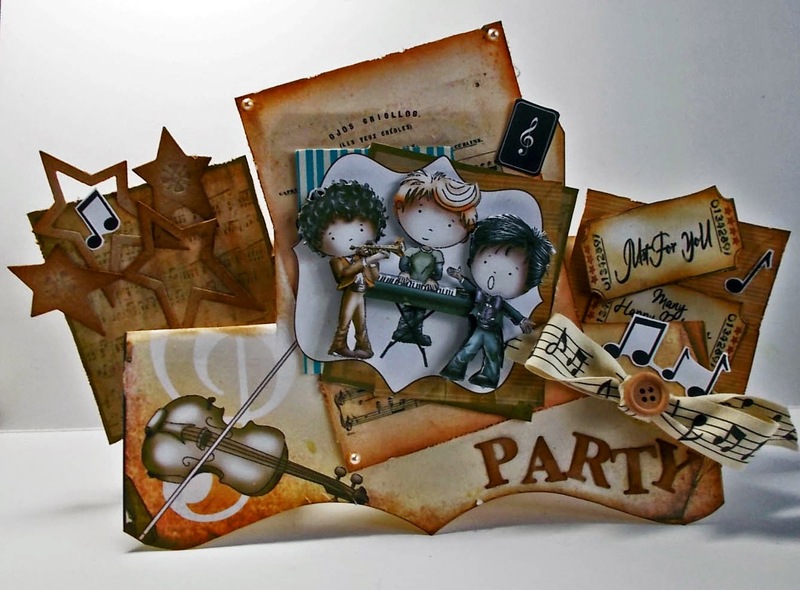 This krafty creation is made entirely from bits and pieces from a design sheet from the Winston Deluxe Papercrafting CD. There are several designs to choose from. I just added twine from my stash, some foam tape to give the little guy some dimension and my card is done - all in under an hour! Fabulous! 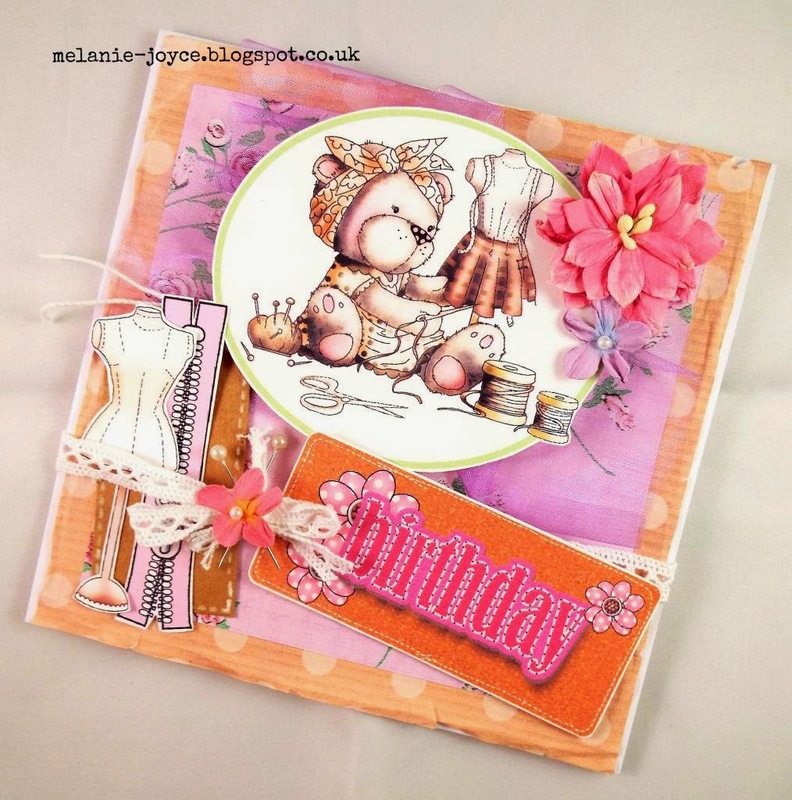 Cheremane - I adore Kraft card so love this theme and just had to use the fabulous Winston Deluxe Cd I couldn't resist choosing the cutest Etty Bear New Dress Image which you can also get on a Digi Download. 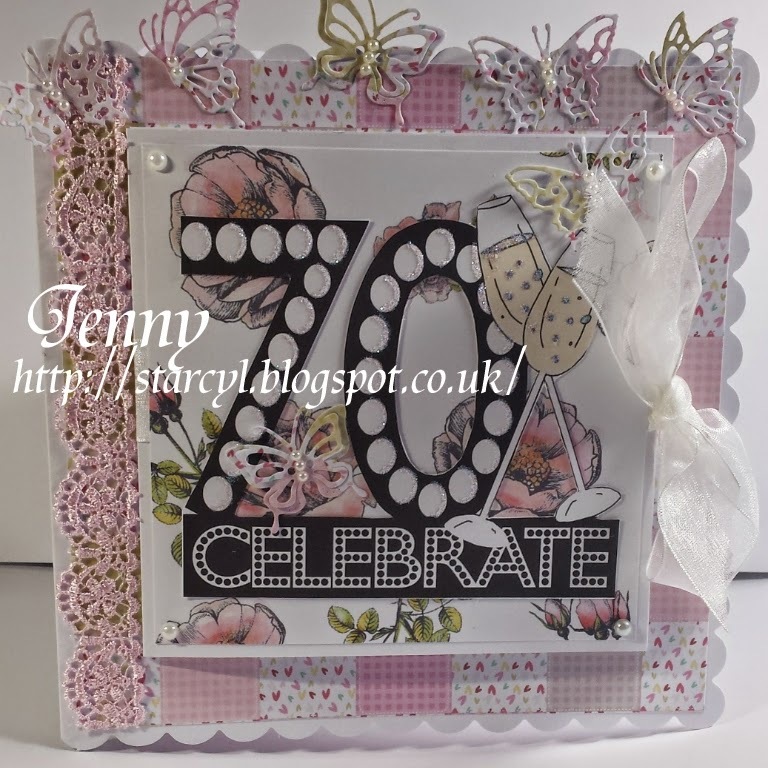 The papers, flowers, butterflies,bow and sentiment are all from the Winston Cd and teamed up with some pearls, lace, glossy accents and a spellbinders grand circles die and of course Kraft card. Pop on over to the Polkadoodles Shop as there are heaps of goodies for all your crafting needs. 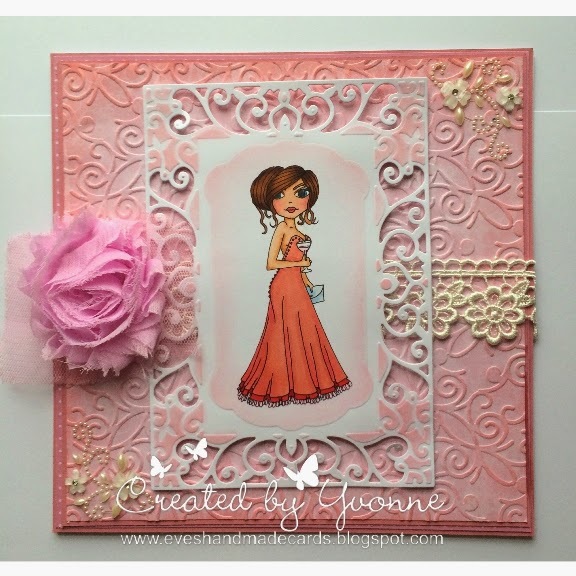 Melanie - I use a lot of kraft card so decided to challenge myself to do something a little different with it than my usual style. This card is about as fussy as I get! I love the colours - pink and kraft go so well together. Of course I just had to use the Winston Deluxe papercrafting CD, as it contains so many truly gorgeous kraft papers. I distressed some polka dot kraft paper then layered a girly pink floral paper over the top to off-set the sepia-toned Etty image - this one was taken from a design sheet on the CD, but it's also available as a digistamp! 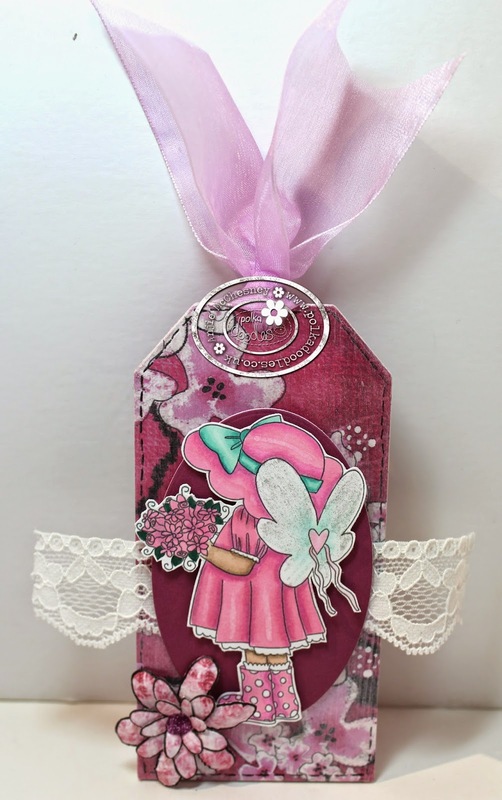 A birthday tag and ephemera, lilac organza, lace ribbon, kraft tag, stick pins and pastel flowers finished the look. Karon - I have played with the new cut files that are now available at Polkadoodles as of this week. They are fabulous and I couldn't resist making some teeny flowers. I used a Kraft card base and then a craft coloured paper from the In the Garden section off of the Studio 12 - Picknix 1 Collection. The sentiment is from the Cherryblossom Lane CD Collection. Cutting File Ivy 2. I used the wonderful Princess/Bride Carriage Digi and I colored my image with Spectrum Noir Markers and Colored Pencils. The background papers come from the Work & Play 9 Love & Kisses - Full Download Bundle . 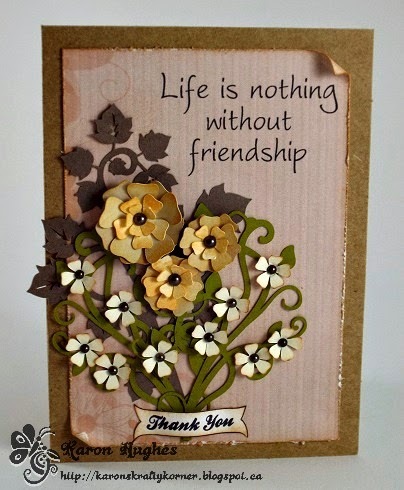 The base of the card is Kraft paper, and the Ivy Cuts are from Kraft cardstock also. I added some pink gems to her hair and on the vines and finished it off with some pretty pink bows. Anna - Today, my card is a compilation of craft paper and very light heather colored one from the Winston Deluxe papercrafting CD . The paper was torn into uneven stripes glued one on top of another and separated in certain spots with lace or ribbon. Besides that, I arranged a bouquet of beautiful flowers, to which I added colorful wire, dried leaves, a little clothes pin, and a cord arranged in a specific, and characteristic for me, manner. I inked everything with brown. The card was made for a Name Day. More details can be found on my blog. Once again, the Design Team out did themselves - fabulous! Please do not forget there is a maximum of 2 entries per person. Winners of our Flower Power challenge will be announced next Friday 20th Feb.
Yay! Friday is here again. I can't believe that we are already into February. are available by clicking on the image below. Design Team Call and not just one but two! some new teamies for our all new Facebook Team. The winners of our Case It Challenge will be announced at the end of this post. Asha: For my project, I'm travelling back in time to this pretty CD released in December 2012 called Cherry Blossom Lane. Adorable characters and cute papers and embellishments fill this spring themed CD. I've coloured the cute bunnies having fun around the Maypole with Graph'It markers and added a floral border. The sentiment is from the In The Garden CD. More papers flowers from my stash for extra power! Susan - Flower Power !!!!!!! 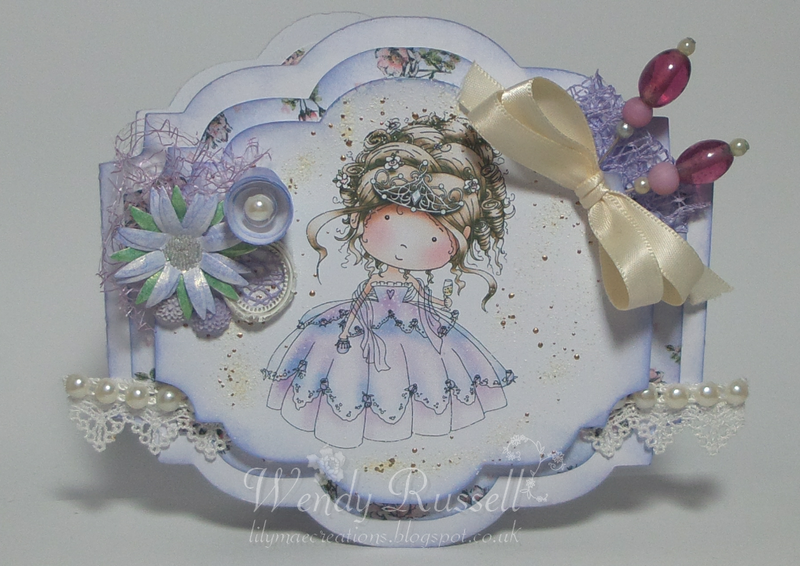 for my card this week I have used papers and a precoloured digi from one of my favourite collections Rose Budd CD. The flowers are from the amazing New Octavia collection also available as a download. Just goes to show how you can mix & match all of your collections. 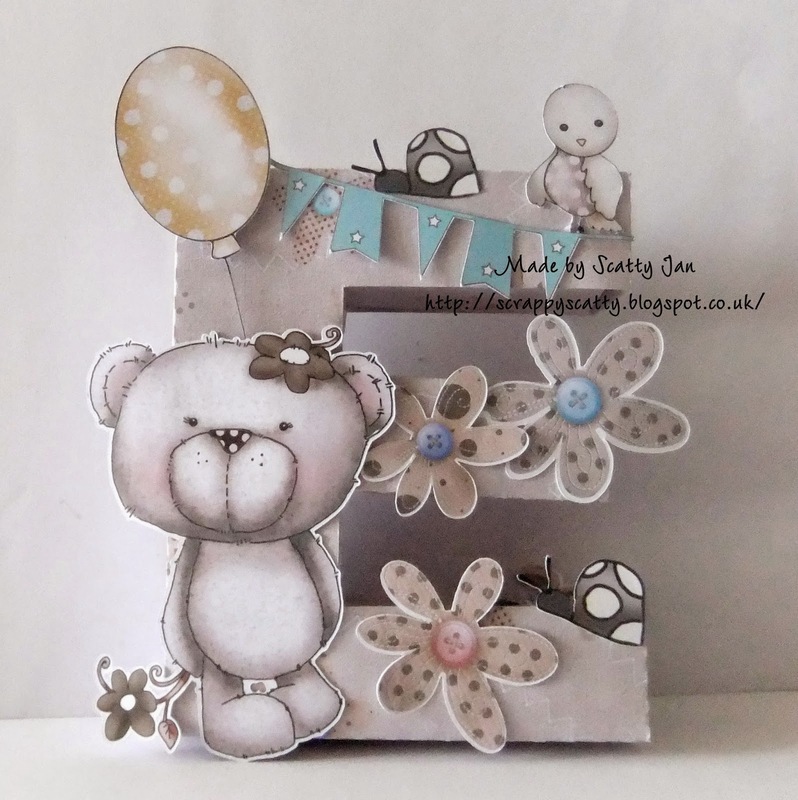 Karon - Thought I would try something a little different this week and made this little gift. 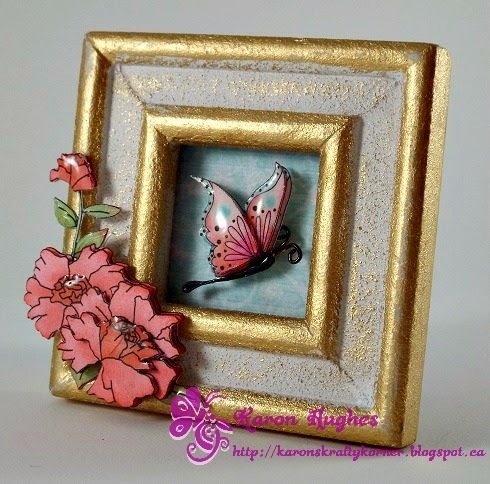 The frame is 3.25" square and I have used the Dollie Daydream Goes East collection. The backing paper, butterfly and flower are all from this wonderful collection. I layered up the butterfly and added some glossy accents and then layered up the flower too, also adding some glossy accents. Melanie - I've once again used the amazing Picknix collection for my card, specifically the In The Garden bundle, which is full of gorgeous images, sentiments and papers. I layered the digital sentiment over a journaling card in a Word program before printing out, then coloured the flowers around the image with a red Spectrum Noir pen. I layered the journaling card with a lovely green polka dot paper from the CD and some scrap dictionary paper from my stash, then embellished with paper flowers, gems and lace ribbon. Cheremane - For my take on Flower Power I have used the adorable pre-coloured Etty Bear from the Winston Cd. You can also get Etty as a Digi download on her own, isn't she just the cutest, I have also used the papers and flowers all from the Winston Cd. Head on over to the Shop where you can get all your accessories to complement your Cd's & Downloads for all your crafting needs. Anna - I really like challenges with flowers. I love arranging flowers on cards into bouquets, or using only two or even one, large flower. Flowers add charm to projects and I always associate them with a beautiful garden. This time, I present an Easter card in violet colors from from the Winston Cd, layered with beautiful doily and gorgeous flowers. WOW - haven't the team done a fabulous job this week. Work & Play 8 collection on download. You have all won a digi!! Please contact us here, and quote PD6002wk3, to claim your prize.